As reimbursement continues its shift from volume to value, providers need better tools for managing the care and costs of their patient populations. With nearly half of all Americans suffering from at least one chronic illness, EHR-based patient registries are key to delivering more efficient and effective care. When designed and implemented effectively, registries can be used to segment and sort patients by risk, condition, and many other criteria — helping providers align higher cost, higher acuity methods with the populations that need them, while keeping other patients in lower cost settings. Registries: Include comprehensive groups of patients, typically based on chronic conditions. A provider could have multiple registries for a specific condition as well as registries for immunizations and wellness. Worklists: Once the larger population is identified on a registry, providers can further stratify and segment their patients into smaller, more manageable subgroups called worklists. Whereas a registry might be maintained at an organizational level, worklists could be created at the individual practice or provider level. Usable: Physicians and other users must be able to adopt registries and worklists into their workflow. They should be intuitive, mobile, and fast, so users can filter, organize, and save new lists with a few clicks. Dynamic: Registries and worklists should not be seen as “reports” to be run monthly, weekly, or even daily. They are up-to-the-minute views of all relevant patient data in the EHR. Flexible: Tools must be adaptable to a variety of care environments and practice settings. Actionable: Users must be able to take action directly from the registry without going to a different screen; once they’ve filtered and sorted their list, they should be able to select one or more patients for an intervention. Interoperable: An effective system must be able to import government or community-based registry data, data from other healthcare organizations, and patient-generated health data. Healthcare organizations empowered with the right patient registry tools will establish a strong foundation for a larger population health strategy. Healthcare providers affiliated with integrated care networks — particularly those using a shared EHR across the continuum of care — will be well-positioned to manage their patient populations more successfully. 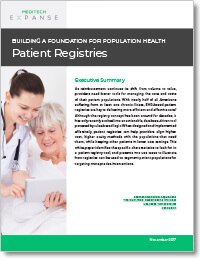 Download this full white paper to see how you can use patient registries and patient lists as part of your population health strategy.